Aero-Yo - the biggest brand in Russia is now available here in Australia! 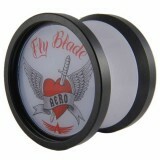 Aero-Yo specialise is making quality YoYos at affordable prices, and is the most popular brand in Russia today! Theiro YoYos feature stylish packaging, great design and professional quality control, ensuring the yo-yos stand out from the crowd and turn them from simple toys to real sports equipment! Aero-Yo has yo-yos for all styles and levels of play from new players to professionals! Grab an Aero-Yo today and play like a Ruski!